Two brain-fudging mentalism bands in two days? Surely not – that would be unrestrained madness! And yet it’s true: after yesterday’s mind-Boggling (that’s a monstrously weak joke that you’ll ‘get’ after reading the post) band, here swaggers along another, leering contemptuously at your sanity. 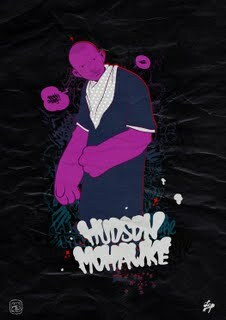 So, cower in fear before Today’s New Band, Hudson Mohawke, whose pun-tastic devotion to lame 90’s action-comedies warrants them a place on ANBAD. Hudson Mohawke won’t damage your eyes, like the movie will, but the unrestrained, crazed weirdness of the sounds might worry your eardrums. ZooO00ooO00oO0m sounds like a computer linked to a radio telescope that’s registering every strange, possibly alien, sound arriving from outer space with a differently pitched bleep. There’s no real order to the bleeping, but it sounds like it may all be connected in some way you just can’t quite understand. Ice Viper staggers around a seedy nite-club, gropes at 80’s synth-funk, touches it inappropriately, and shoves it out into the back alley to slump, confusedly. Still On It thumps and quivers, an acid-drop-soul smooch to woo and unease in equal measure. Hudson Mohawke is a pop merchant with a huge, bizarro twist. Slick, and cranky, like an alcoholic 80’s soap-hunk. Listen here! Posted on October 1, 2009 by Joe Sparrow. This entry was posted in Today's New Band and tagged 80's/90's, Creepy, mystery. Bookmark the permalink. >I really hope someone already let you know that Hudson Mohawke is not a "band" but 1 guy.. he's a producer and "Butter" coming out soon is his debut album. Michael Jackson wanted him to produce a song for him, but sadly they were just in talks for it shortly before MJ died. Hudson Mohawke.. not a band.. just 1 guy, Ross Birchard.. DJ and Producer.